Many of you probably already know the story of where the O&O portion of this blog name comes from. They are my two kitties, and they are the queens who preside over this kingdom in which I humbly live. The kitchen is a part of their (cough totalitarian cough) domain, and they will eat anything and everything that isn't stored somewhere you need functional thumbs to open. One of them will bite through plastic to get at brioche buns (did I mention they have high class taste? ), and the other...the other will eat my homemade garlic scape garganelli as they are drying on the counter. I will scream, she will run away, and I will mope over the state of the gnawed-on pasta which I spent so many hours making. Which leads me to a question for you guys. How much time do you have this week? At least four uninterrupted hours? Gooood, that means you can make this pasta. I'm not joking. I know that sounds a little absurd, but when you're savoring each delicious, garlicky bite, it's so much more satisfying knowing you painstakingly rolled every individual garganelli by hand. And to make things even more interesting, there are garlic scapes in the dough itself, adding another layer of complexity and uniqueness to the flavor, which is something you won't find in the pasta aisle of your local store. If you have never made fresh pasta, know that it is a labor intensive process, especially with short or filled pastas. In my experience, the amount of effort it takes comes second only to homemade croissants. But it's well worth it because it is just that freaking good. Case and point, I made this pasta twice last week, the second time within 48 hours of the first. My feet and neck hurt so bad from all the standing and hunching over the counter, but I would do it another 10 times over. Love works in funny ways. As for the ever elusive, but most delicious garlic scapes: you'll want to buy the curliest, most tender ones you can find. Avoid overly woody or fibrous ends at all costs. I've had success finding good ones with my CSA box and farmer's markets, but not at grocery stores and supermarkets. So grab them while you still can, and when you do, please consider making this pasta. You can find the garganelli board I used here. Unfortunately, the dowel it came with was far too wide. I recommend getting a dowel either 1/4 or 5/16 inch in diameter, you can find them fairly easily at your local hardware store. Garlic scape season is very short (June and July), if you need a substitute, I think garlic chives or even spring onions will do a fine job. The water content of the plants might be different, so keep an eye on your dough and dust on some additional flour or give it a spritz of water as needed. Makes about 1 lb of pasta. Blend the garlic scapes in a food processor or blender until finely minced and as close to a purée as possible. Mound the flour on a clean counter and create a well in the middle. Add eggs, egg yolks, and 1/2 cup of processed garlic scapes to the well, if you have extra garlic scapes, save them for another use. 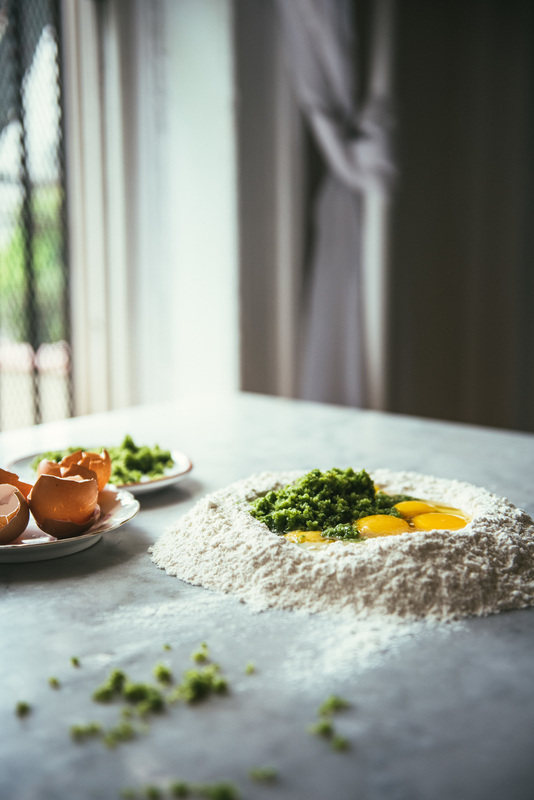 Using your fingers, break up the eggs and start drawing in the flour using a swirling motion. Keep mixing, occasionally using a bench scraper to move the flour back to the center when the well becomes too wide. Once the dough becomes too difficult to mix with your fingertips, form it into a ball and start kneading with the heel of your hand. Keep kneading for at least 10 minutes until the dough is smooth and elastic. If at any point the dough is too sticky, dust on some additional flour a teaspoon at a time, if it's too dry, use a spray bottle to add some moisture a little at a time. You can stop kneading once the dough enthusiastically springs back at you when you press it with your fingers. Place a clean bowl over the dough and let it rest for 30 minutes to an hour. Once the dough has rested, split it into six equal portions with your bench scraper. I recommend working with two portions at a time to prevent the dough from drying out, keeping the others covered while you work. Liberally flour the dough and take each portion through the lowest setting on your pasta machine. Fold into thirds like a letter and take it through the lowest setting once more. Take the dough through each subsequent setting on the pasta machine until thin but not transparent (on an atlas, this was 7 out of 9). If you roll it too thin, the garganelli will lose its structure once you cook it, "floppy" is the best way I can describe it, so I recommend erring on the side of thicker rather than thinner if you aren't sure. Cut each sheet of pasta into 1 & 1/2 inch squares. To roll into individual garganelli, place a square of pasta flat on your garganelli board, gently roll it around the dowel using your fingers and when only a small triangle of dough is peeking out from underneath the dowel, press firmly while rolling the dowel up to seal the edges. You want to press firmly enough to seal the edges, but not so firmly that you're rolling the dough thinner. Transfer each finished piece to a lightly floured portion of your counter to dry. Once all the pasta has been rolled, let air dry for 45 minutes to 1 hour before cooking. If not using immediately, place pasta on a baking sheet in one layer, wrap it in plastic and freeze. Once completely frozen, you can transfer them to a zip top bag. Bring a well salted pot of water to a boil. While you're waiting, heat a heavy-bottomed stainless steel pan over medium high heat. Once hot, add olive oil, garlic, and red chile flakes. Cook for 30 seconds or until the garlic starts taking on some color. Add shrimp, salt and pepper to taste, and toss frequently until the shrimp is just cooked through. Transfer the contents of the pan to a clean bowl and put it back on the heat. Turn the heat to medium and add butter. Swirl it around until melted then add white wine and simmer until reduced by about a third, 3 to 4 minutes. While the sauce is simmering, add garganelli to the boiling water and cook for 3 minutes. Drain and add the pasta along with the shrimp to the white wine butter sauce, and toss for 15 to 20 seconds. Remove from heat, plate, and serve immediately with fresh herbs and parmesan.